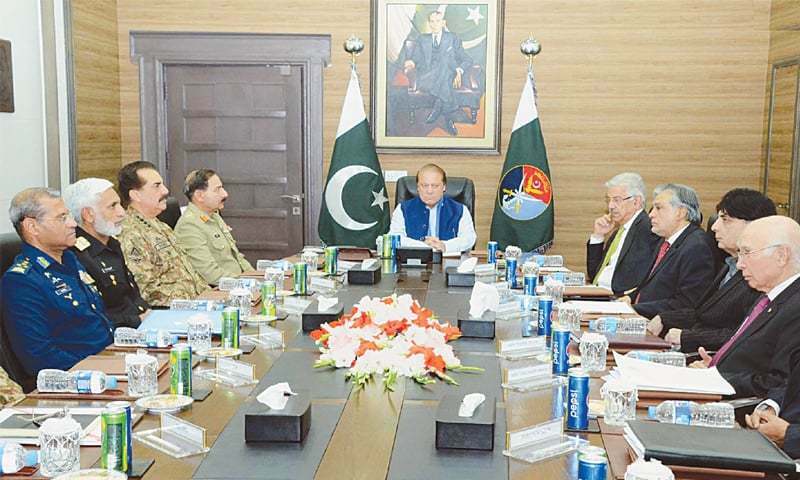 The Natio­nal Command Authority (NCA) has renewed the proposal for a regional Strategic Restraint Regime as it expressed alarm over India’s growing conventional and nuclear arsenals. The NCA — the principal decision-making body on nuclear issues — at its meeting presided over by Prime Minister Nawaz Sharif on Wednesday, “took note of the growing conventional and strategic weapons’ development in the region”, according to a press statement issued by the ISPR. Besides expressing its resolve to do everything, short of entering an arms race, for keeping national security intact, the NCA “re-emphasised Pakistan’s desire for establishing the Strategic Restraint Regime in South Asia”. The need for a sustained dialogue with India for resolution of outstanding disputes was also underscored. The proposal for Strategic Restraint Regime has been on the table since Oct 1998, but India, which is opposed to a regional mechanism, has always avoided discussions on it. Experts believe that regional stability, in the absence of such an overarching strategic architecture, has been tenuous. The NCA was of the view that development of conventional and nuclear weapons by India had “adverse ramifications for peace and security” in the region. Pakistan has been concerned over India developing nuclear submarine INS Arihant, which is reportedly close to commissioning. This will take India closer to completing its nuclear triad. A number of other Arihant-class strategic submarines and nuclear-powered attack submarines are also being developed. Reports about India building a secret Nuclear City in southern Karnataka state for producing thermonuclear weapons have also been seen as worrisome and so has been its expanding missile programme. India, it is believed, has used the Nuclear Suppliers Group’s waiver to exponentially increase its fissile material stocks, upsetting the region’s strategic stability. Recent reports by the Stockholm International Peace Research Institute and the International Institute for Strategic Studies have confirmed that India is the world’s biggest arms importer, accounting for 14 per cent of global arms imports and which are more than those of China and Pakistan combined. India has been the top importer since 2013 and the shopping frenzy aimed at boosting its conventional capabilities is continuing. Pakistan regrets that the West has been ignoring India’s activities because of its commercial interests and for the sake of containing China, but has kept pressure on Pakistan describing its nuclear programme as the fastest growing. “The developments exacerbate Pakistan’s security dilemma, compelling it to make desirable improvements to achieve a balance and minimal developments in its conventional and strategic force posture,” an official explained on the background, saying the world’s focus has been on Pakistan’s reaction instead of Indian provocations. The NCA reiterated its policy of maintaining Full Spectrum Deterrence for covering the entire spectrum of threat, including Cold Start Doctrine and land-based standoff capability in Andaman and Nicobar Isles. NUCLEAR SECURITY SUMMIT: One of the important agenda items was to prepare for the final edition of Nuclear Security Summit being held next month in the United States. The NCA was briefed on the steps Pakistan had so far taken in the realm of nuclear security. “Pakistan would continue to contribute meaningfully towards the global efforts to improve nuclear security and nuclear non-proliferation measures,” the statement said. Pakistan’s assertion that the upcoming summit in Washington was the final episode of the series started by President Obama is being implied as a signal that it is no more interested in any similar initiative in future and instead wants International Atomic Energy Agency to play the leading role in nuclear security commitments. The NCA approved, in principle, the decision to ratify the 2005 amendment to the Convention on Physical Protection of Nuclear Material. At the last Nuclear Security Summit, Pakistan had indicated its willingness to consider ratification of the amendment, which provides for security of nuclear facilities and domestic transport. Pakistan is already a signatory to the Convention on Physical Protection of Nuclear Material, but the amendment has introduced significant changes in it because of which fresh ratification was required. The decision on ratification is also meant to reinforce confidence in the steps taken by Pakistan for security of its nuclear programme and allied facilities in addition to strengthening its case for mainstreaming in global nuclear order. “NCA noted with satisfaction that Pakistan has the requisite credentials that entitle it to become part of all multi-lateral export control regimes, including the Nuclear Suppliers Group, for which Pakistan seeks adoption of a non-discriminatory approach,” the statement said. Star Wars 8: Can you really buy an autographed Last Jedi script HERE? How is it possible?